I will be updating this page with my Haunted Montreal (http://hauntedmontreal.com/) tour dates as I receive them. If you want to book me for one of these tours, contact Haunted Montreal and ask for The Professor. Once I get the minimum number of people registered (10+) and we find the right date, I can give you the tour! Also, if you want to reach me directly, we can pick the right date and make arrangements with Haunted Montreal. If you want to book a haunted walk, visit the Haunted Montreal website and book your spot, but do it quickly because there are a limited number of tickets available per tour! If you cannot make any of the dates listed on the site, but you still want a private tour with me, you can contact Haunted Montreal with requested dates and if I’m available, we can make it work. Send an email to info@hauntedmontreal.com. Café Mariposa‘s Open Mic night ends with a story about the Devil. Jeff Deeprose on fiddle. Cafe Mariposa’s Open Mic night is every Thursday evening at 6pm. I am pleased to announce that I have been booked as an official Guide for Montreal’s Haunted Tours. My first haunted tour will be of Griffintown on September 29th, 2017. I will also be giving haunted tours of the Mountain in October. 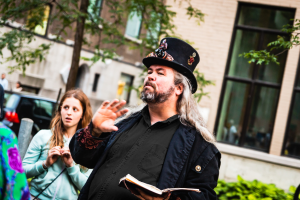 UPDATE: The Montreal Gazette did a report on the Haunted Walk featuring yours truly as the tour guide! You can watch the video reporting piece by clicking here. Back in 2009, I was telling stories at an elementary school in Montreal and I told a story that I originally heard from Priscilla Howe called The Ghost with One Black Eye. It has remained one of my more beloved stories to tell to 3 to 6 year old children. I was visiting a friend recently and over breakfast, her son Jack and his friend Sophie asked me to tell them a story. I told them this ghost story, and to my great surprise, Jack’s mum Deirdre later showed me a video of these two kids retelling the story. With their parent’s permission (thank you Agnes, Deirdre, and Jean), I can now share their telling of this story. Enjoy! This year at the Bloomsday Festival (Montreal, Quebec), I was asked to co-host (with Donovan King) an evening of Irish poetry and stories down at bar Kaffein on Bishop street. It’s not every day I get described as “magnificent”. Now if the rest of the festival is equal to Tuesday’s event, An Irish Story (An scéal na hÉireann), which was billed as an evening of storytelling and poetry, hosted by Donovan King and the magnificent John David Hickey, who thrilled all those in attendance with his great stories (modern adaptations of traditional Irish folklore and legends), then everyone is in for a treat. To make a bard one needs to find, the recipe to create its kind. Never easy, always changing, from culture to culture, recipes ranging. Below we find a simple mix, to make a bard, and learn his tricks. Start with 1 cup honey, for the best stories come from honeyed tongues. Add 1 cup mead to loosen the mind and mouth. A dash of sass, a dash of pluck, a silver coin for good luck. Lastly add to the brew one sprig of eyebright to sharpen the wit and open the mind. Add to a sturdy pot and boil over the intense flames of the bardic fire. Stir frequently, listening for the tell tale signs of bubbling and free-style rapping that tell you it is almost complete. Once cooked, allow to cool and take on its natural shape, that of the master storyteller and keeper of sacred tales. My friends down at the Mountain Ancestors ADF Grove are actively supporting our brothers and sisters who are defending Standing Rock. The folks up there need chainsaws: their Elders up there are getting cold and they can’t process the firewood fast enough with the tools they have. 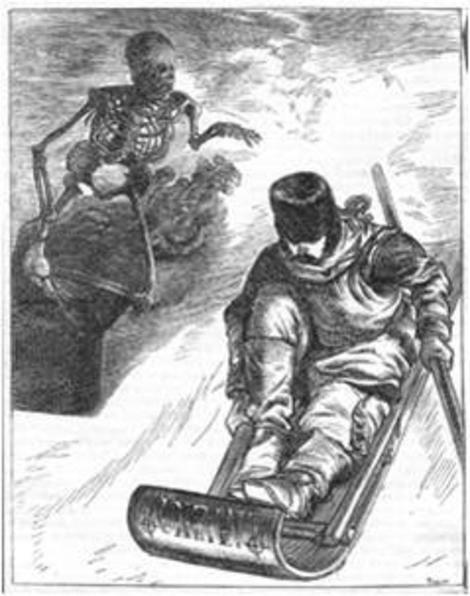 Now, we need to get winter clothes and winter lodgings together, as the cold descends. Please consider making a donation to help them keep the Standing Rock Elders safe! Greetings, All! This is a #CallToAction with #FreeStuff for you! As many of you know, our Casey McCarthy is heading to Standing Rock to bring some much-needed winter supplies to the Water Protectors. They are in need of supplies for the winter, and we need your help to get them! Fellow ADF-member and celebrated Storyteller JD Hobbes is offering a free download of his album, a collection sure to entertain story-lovers of all ages, for all donations over $50. Click on his name for more information and some cool video clips. Make your donation at MountainAncestors.org under Services. I am proud to support this cause and I hope you will join me. It is up to us to decide how this story will be told to future generations. In the aftermath of the 2016 American Presidential election, Canada needs to be the strong, united nation now. The world will be looking to us for strength, for guidance, for leadership. We need to be The Beacon on the Hill. Our leaders need to be strong and hold true to Canadian values. They need to protect us and to inspire us, and in turn, we need to support our country and keep it on the right path. We the people also need to be strong. We need to not give in to fear or hatred or intolerance. It is 15+ years of fear, hatred, and intolerance that have led to this moment. As Canadians, we need to rise above these base emotions and work towards better solutions. We need to let compassion guide us, rather than letting fear control us. We need to consider our second impulse rather than acting blindly on our first impulse. This is Canada’s moment to shine, to provide the example, and to offer shelter and compassion to those who need it. We have a long history of doing that and we cannot afford to be less now. We need to be more. We can be more. We will be more. Once upon a time, there was a teacher who was a Buddhist monk. His great joy in this life was to have a snack and a nap afterwards. Before every lesson, he ate so much that he could barely move. Soon after the beginning of the lessons, he always took a nap and slept until the bell for the end of the lessons sounded. At one time, Lee took care of his sick father during the night and fell asleep at school in the morning. 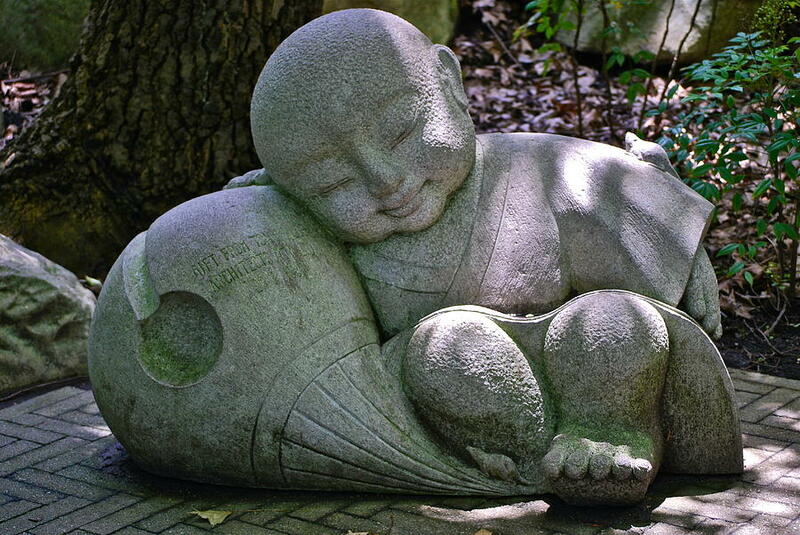 He slept so deeply that he didn’t even hear the bell, which woke the monk. “And what did the all-powerful Buddha said to you?” snarled the monk.